Back then, the picture looked like a drawing and I couldn’t find any information that it actually existed. 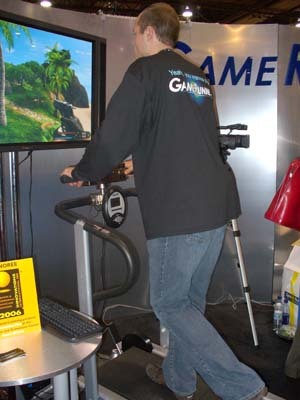 My evaluation of it back then was that it looked like a cheap treadmill hooked up to a controller. It gave me fantasies of hacking a thrift store reject and a Xbox controller. My evaluation of the strength of the treadmill is about the same as it was before, but more importantly, this controller didn’t seem like it would get my heart rate up unless I played a racing game. They were demonstrating it with a first person shooter game. They only needed to walk on the treadmill when the character needed to walk. First person shooter games consist of a lot of hiding and shooting. I watched the employees of GameRunner play for quite a while and not once did they even break into a run. This might be better than sitting on the couch and playing, but just barely. GameRunner gets my positive approval, though. It’s over a year since my Exercise Gaming entry and so many of the companies are out of business. GameRunner is still around and they had a strong showing at this show. 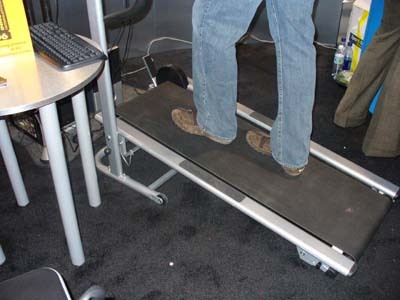 I hope they are successful and are able to create a product with a treadmill that looks a little more sturdy. My biggest concern with this product is that it’s for PC only. I do all my gaming on console games, so I have no use for this product. It would be nice if there was an adapter that would let it work on Xbox and PlayStation. That might be their next iteration of this product, which might make this controller useful. Can you imagine playing Project Gotham 3 with that thing? Also, we would have had to hire marathon runners to keep our displays active all day if we had set the belt ratio for running. The GameRunner has ten different settings so if you want to (or can) run through several hours of game play, feel free. If you are going to make statements denigrating our product, at least make them accurately. The things you pick on aren’t even remotely true. You should talk to your employees who manned the booth. They ignored us while we tried to find out information (even though we were taking pictures and asked them for some literature). It wasn’t a busy time of the day, they just were too busy talking to each other and playing. The original Xbox does NOT have a USB port, so there must be some sort of converter that would make it work. It would have been nice if your employees had noticed us and showed us the features of your product. It’s good to know that there are other settings to increase the intensity and that the GameRunner works with the popular gaming consoles. On the bottom of the GameRunner homepage, you will see a link to a great supplier of the adapter so that you can plug the GameRunner into old consoles. They run between 12 and 30 dollars.